We have already learned a fair amount about the details of Odell Beckham Jr.‘s new mega-deal with the Giants, but Ralph Vacchiano of SNY.tv passes along some important information about OBJ’s cap hits. While his contract will provide New York with $3MM of cap relief in 2018, Beckham’s cap number balloons to $21MM in 2019 and will be between $15MM and $19.75MM from 2020 to 2023. In 2019, then, the Giants could be devoting half of their cap space to just five players, and they are projected to have just $12MM in cap room in 2019 at the moment. That number will increase with several easy cuts and restructures, but Beckham’s contract will force the club to make a few difficult decisions, which Vacchiano explores in greater detail. Ben Volin of the Boston Globe reports that Shaq Mason‘s extension with the Patriots includes $45MM in new money, a $12MM signing bonus, and $5MM in incentives. He also provides a breakdown of Mason’s guarantees, base salaries, and cap numbers (Twitter links). Jim Owczarski of the Cincinnati Enquirer reports that Geno Atkins‘ extension with the Bengals includes a $13MM signing bonus, which is part of $17MM in guaranteed money. Atkins is also eligible for up to $500K per year in per game active bonuses and workout bonuses. Carlos Dunlap‘s new deal with Cincinnati, meanwhile, features $18MM in guarantees and several sacks escalators. Owczarski also provides the base salaries for both players. Greg Mancz‘s two-year extension with the Texans, which kicks in after the 2018 season, is worth $6MM in total, per NFL insider Adam Caplan (via Twitter). The Bengals have signed defensive end Carlos Dunlap to a three-year, $45MM extension, as Adam Schefter of ESPN.com tweets. The new deal will keep him in place through the 2021 season. Word of Dunlap’s deal broke just moments after the Bengals reached agreement on a four-year deal with defensive tackle Geno Atkins. In one fell swoop, the Bengals have locked down two pillars of their defensive line. Dunlap was set to enter the final year of the six-year, $40MM extension he signed in 2013. The 29-year-old will earn a base salary of $7MM (well below his true value) before starting the new deal. Dunlap, 29, has been tremendous in Cincinnati, particularly in the second half of games. The advanced metrics at Pro Football Focus have routinely rated him as a top-30 edge defender over the past seven seasons and he has been equally strong against the pass and the run. Earlier this offseason, we estimated that Dunlap would have to play out the 2018 season at a high level in order to secure a $15MM/year deal. Instead, Dunlap has landed that deal without risking injury or regression, so his camp did quite well in these negotiations. With Dunlap and Atkins squared away, the Bengals can shift their focus to other extension candidates such as cornerback Darqueze Dennard. The Bengals also have a trio of tight ends to consider in Tyler Kroft, Tyler Eifert, and C.J. Uzomah, and they may want to leave some money in the coffers to re-sign defensive end Michael Johnson after the 2018 season. One of the final pieces to the Vikings‘ extensive extension puzzle, Stefon Diggs does not want to leave the Twin Cities anytime soon. Although the emerging wide receiver could be in line for WR1 money on the open market next year, Diggs would prefer his second contract come from the Vikings — as so many of his peers’ have in recent years. The Vikings have discussed an extension with Diggs’ camp, but nothing appears to be imminent, per Tomasson. Diggs and Anthony Barr represent the final two steps in Minnesota’s years-long effort to fortify a core, one that stands to be in its primes throughout Kirk Cousins‘ contract. If Diggs were to hit free agency, though, he would almost certainly be a coveted commodity. While Odell Beckham Jr. could theoretically be a 2019 free agent, that seems unlikely. Diggs could be the top wideout on a market that as of now would include Devin Funchess, Randall Cobb and Kelvin Benjamin. Here’s the latest from the North. 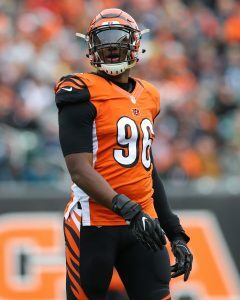 Carlos Dunlap and the Bengals may be approaching the finish line on what would be a third Cincinnati contract for the veteran defensive end. Drew Rosenhaus spent time in Cincinnati this weekend, and Dunlap said (via Paul Dehner Jr. and Jim Owczarski of the Cincinnati Enquirer), “When you see him out here you know he is doing something. He’s out here for a reason.” Dunlap and the Bengals have made progress on a deal this offseason, but the 29-year-old pass rusher remains tied to his second contract. That deal expires after this season. Dunlap wants to play the rest of his NFL days in Cincinnati. “I would love to get it done. I would love to finish my career here as a Bengal,” he said, via Katherine Terrell of ESPN.com. Lamar Jackson‘s slender frame emerged as a pre-draft topic, but the Ravens rookie not planning a significant weight-gain project as he readies for the NFL. Jackson said (via Terez Paylor of Yahoo.com) he’s at 216 pounds and doesn’t want to be above 220, in order to maintain his elite speed. First-round pick Mike Hughes will work as the Vikings‘ kick returner, while veteran Marcus Sherels will start off as the punt returner, Tomasson tweets. Though there will be competition, this would be the team’s preferred arrangement. Re-signed this offseason, Sherels has been Minnesota’s punt-return man for seven years. Hughes only worked as a return man in one season, last year at Central Florida, but he totaled three return touchdowns in that time. As expected, Mychal Kendricks saw his first Browns action as a weak-side linebacker, Nate Ulrich of the Akron Beacon Journal notes. Recovering from offseason ankle surgery, the former Eagles ‘backer is participating on a limited basis for now. Ulrich suggests Kendricks may be a super-sub, working at all three Browns linebacker spots while Christian Kirksey, Jamie Collins and Joe Schobert retain their first-string roles. Earlier this year, defensive end Carlos Dunlap opted to skip the Bengals’ organized team activities. The decision to work out on his own in Florida cost him $300K in bonuses, but it may have helped him ramp up pressure on the team as he pushes for a new deal. For his part, Dunlap claims his decision was made for football reasons. Either way, it’s clear that Dunlap wants to stay with the Bengals beyond 2018 on a new and improved deal. The Bengals also want to keep him for the long haul, but only at the right price. Dunlap is entering the final year of the six-year, $40MM extension he signed in 2013. The 29-year-old will earn a base salary of $7MM, which is well below his true value. Extending Dunlap is a pricey proposition and the decision is complicated by the club’s other extension candidates. Fellow defensive lineman Geno Atkins is entering the final year of his contract and a new pact may call for upwards of $12MM per year. Cornerback Darqueze Dennard is coming off of a career year and the Bengals would like to keep him, despite the presence of Dre Kirkpatrick and William Jackson III. There’s also a trio of tight ends to consider in Tyler Kroft, Tyler Eifert, and C.J. Uzomah, and the team may want to leave some money in the coffers to re-sign defensive end Michael Johnson after the 2018 season. The Bengals have also invested heavily in defensive ends in recent drafts by adding Carl Lawson, Jordan Willis, and Sam Hubbard. In theory, they can part with Dunlap if the price gets too high if they are confident in their your DE group. Still, Dunlap has been tremendous in Cincinnati, particularly in the second half of games. The advanced metrics at Pro Football Focus have routinely rated him as a top-30 edge defender over the past seven seasons and he has been equally strong against the pass and the run. Even if the youngsters could do an admirably job in his stead, losing Dunlap would hurt the team’s front seven. Dunlap is well aware of the riches that could await him in free agency as the edge defender market continues to rise sharply. In theory, Dunlap could parlay a big 2018 season into a $15MM/year deal, but he would be taking a risk if he cannot turn in another quality season for the Bengals. A new deal would give him financial security and, depending on the length of the deal, give him an opportunity to retire with the only club he’s ever known. There are a lot of mouths to feed in Cincinnati, but Johnson’s expiring $6.1MM contract should provide the team enough room to get a deal done. If Dunlap is willing to sacrifice some upside in order to remain with the Bengals, the two sides could find a midpoint with a four-year extension in the range of $50MM. Alternatively, a shorter extension could make sense for the two sides. An additional three years added to Dunlap’s contract would allow him to hit the open market again at the age of 32 and give the Bengals some wiggle room should they look to hang on to their trio of younger defensive ends. 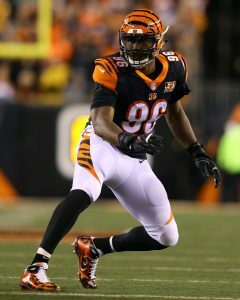 The Bengals have made progress on a contract extension for Carlos Dunlap, as the veteran defensive end told Geoff Hobson of Bengals.com. Dunlap staged something of a short-lived holdout by failing to attend organized team activities earlier this year, but Cincinnati head coach Marvin Lewis said Dunlap’s absence was “not a big deal.” Dunlap has since reported, and claims his missed practice sessions were not contract-related. Instead, Dunlap said he simply preferred to work out in Florida, although he did sacrifice a $300K bonus by doing so. The Bengals have two high-profile defensive linemen entering contract seasons, as both Dunlap and defensive tackle Geno Atkins‘ deals expire after the 2018 campaign. While Cincinnati may view Atkins as a priority, Dunlap also needs a new pact, as the six-year, $40MM extension he signed in 2013 is now coming to a close. Dunlap, 29, will earn a base salary of $7MM for the upcoming season. Dunlap is still an excellent player, as he’s averaged 10 sacks over the past three years and graded as the NFL’s No. 23 edge defender in 2017, per Pro Football Focus. But the Bengals have invested heavily in defensive ends in recent drafts, picking up Carl Lawson, Jordan Willis, and — most recently — Sam Hubbard. Bengals defensive end Carlos Dunlap will end his short-lived holdout and report to the team soon, according to his teammate Michael Johnson. So far, Dunlap has been the only Bengal not present for voluntary OTAs as he enters the final year of his contract. It was reported last week that Dunlap had missed the beginning of OTAs, and he never showed after that. He forfeited a $300K workout bonus by not showing up, but coach Marvin Lewis called it “not a big deal” at the time. Lewis apparently knew what Dunlap was thinking, as the star pass-rusher has now made it clear he doesn’t plan to extend his holdout into the mandatory phases of the offseason program as he angles for a new contract. Dunlap has been a force for the Bengals and a staple of their defense since entering the league as a second round pick back in 2010. Over the past two seasons, Dunlap has 15.5 sacks and 22 passes defended. His teammates don’t seem too concerned about Dunlap’s absence, as Johnson said “he’ll be back ready to roll” when he returns. Entering the final year of a six-year, $40MM contract he signed back in 2013, Dunlap will surely be looking for a raise after he’s made the Pro Bowl two out of the past three seasons. The Bengals’ other star defensive lineman, Geno Atkins, is also entering the final year of his contract and the Bengals are reportedly looking to extend him first. While he may have to wait until the Bengals get a deal done with Atkins, still in his prime at the age of 29, Dunlap should get the extension he wants from the Bengals at some point. Defensive tackle Geno Atkins is near the top of the Bengals’ wishlist of players to extend. The six-time Pro Bowler is entering the final year of a five-year $55MM extension and though he turned 30 earlier this week, he’s not showing signs of slowing down. Atkins has tallied nine sacks in each of the last two seasons without missing a game. In fact, he hasn’t missed a game since 2013. The Bengals have indicated his extension will certainly be a priority. “In our football business, you pay for high-end talent and Geno has been at the top of our industry for a long time and we think he can continue to do that and that’s why we’re trying to see what the opportunities are going forward,” said Bengals vice president Troy Blackburn to Paul Dehner Jr. of the Cincinnati Enquirer. Atkins set the market for defensive tackles back in 2013 but has since been upstaged by the likes of Gerald McCoy (seven years, $98MM) and Ndamukong Suh (six years, $114MM — with the Dolphins). Suh most-recently signed a one-year, $14MM deal with the Rams. The Bengals have another defensive lineman nearing free agency in Carlos Dunlap. He’s also entering the final year of his deal — a six-year, $40MM extension signed in July 2013. The 29-year-old two-time Pro Bowler hasn’t logged less than 7 1/2 sacks in a season since 2013 while not missing a game since 2012. Blackburn said “That’s right” to Dehner Jr. when asked if Dunlap was viewed in the same scope as Atkins. But excess talent at defensive end in Carl Lawson and Jordan Willis could complicate matters. “At the same time, we’re going to be looking at the young guys we have coming up,” Blackburn said. John Ross had an abysmal rookie season with the Bengals, fumbling on his only touch of the year. But his lack of production didn’t have to do with a fractured relationship with coach Marvin Lewis. “He wasn’t in my doghouse. I don’t have a doghouse,” Lewis said to Geoff Hobson of Bengals.com. “I think he’s all the ability we wanted. That’s why we drafted him. He had to get fixed. We knew he was injured going in and he got nicked up a couple of times in his lower legs and the other shoulder was bothering him. He’s all fixed now.” The Bengals took the speedster out of Washington with the No. 9 overall pick of the 2017 draft. Earlier this week, Bengals president of player personnel Duke Tobin acknowledged that building around a player like Vontaze Burfict hasn’t been “ideal” but the team plans to stick by him and his recently-signed three-year extension for the time being. Burfict is suspended for the first four games of the upcoming season for violating the league’s policy on performance-enhancing substances.